Harrisburg gets a bad rap for being an ugly city. 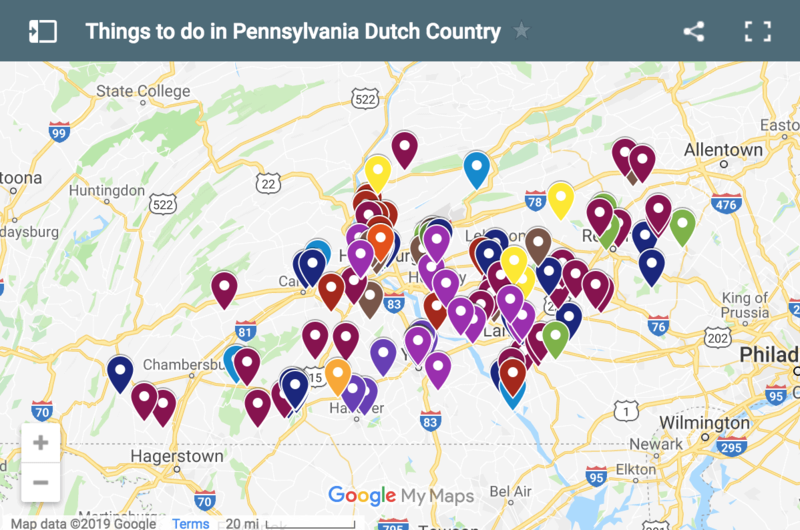 While it might not have a captivating skyline like Philadelphia or Pittsburgh, and it might lack the charm of some of PA’s small towns, there is a lot of beauty in the city if you know where to look. Living near Harrisburg, I’ve had many opportunities to head into the city and take photos. I’ve discovered many beautiful areas for great photos of Harrisburg. 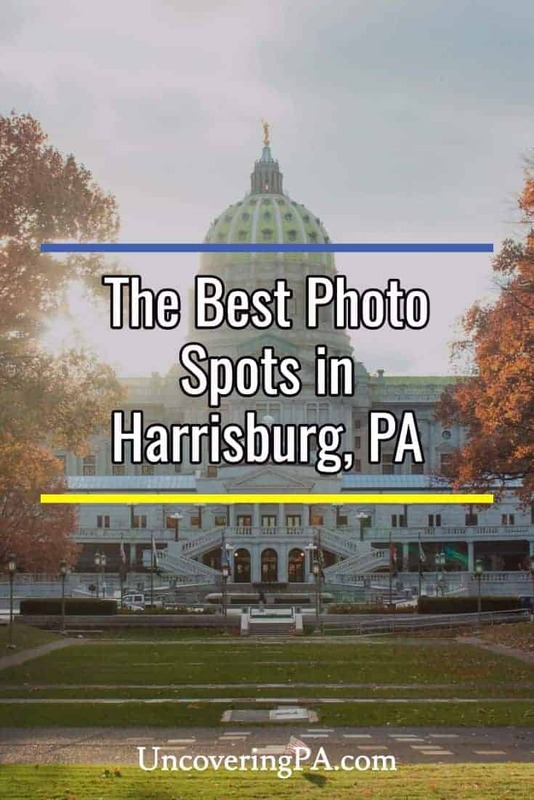 If you are looking for the best photo spots in Harrisburg, check out my top suggestions below. It’s worth noting that to keep things simple, all of these photo locations are either located within Harrisburg city limits or are places to shoot the city skyline from across the river. 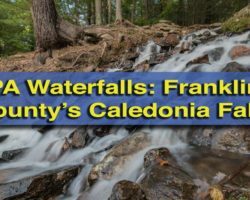 There are many other great spots nearby that are not included in this list for the sake of brevity. The Pennsylvania Capitol as seen from State Street. More specifically, State Street between Front Street and Third Street. 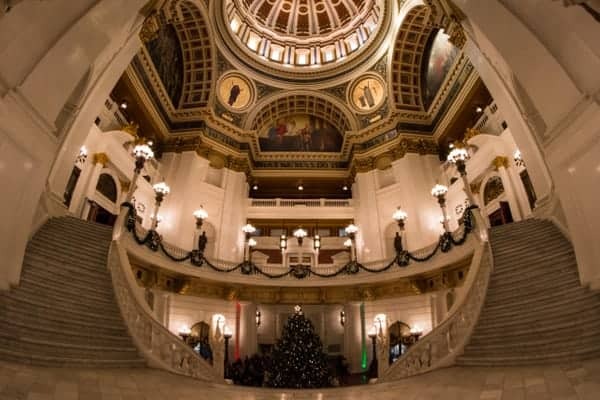 This portion of roadway leads directly to the front steps of the Pennsylvania Capitol Building, one of the most beautiful government buildings in the country. The wide roadway has a beautiful median that leads the eye directly up to the Capitol. 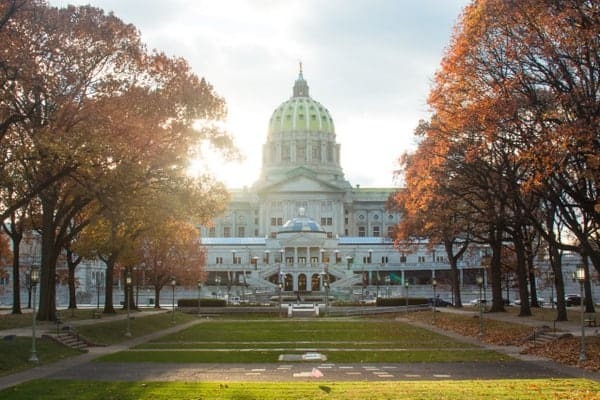 Whether you photograph this building from the steps or from further back on State Street, no visit to Harrisburg is complete without a shot of the Capitol from this vantage point. 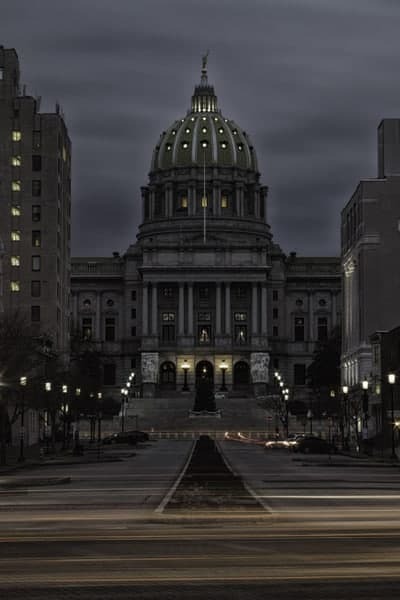 A moody sunset over the Pennsylvania Capitol. In addition to the great view of the Capitol, State Street also features several beautiful churches. The doors to St. Patrick’s Cathedral are open from time to time, and it’s worth going inside to check out the beautiful architecture if you can. Looking up at the Rotunda of the Pennsylvania Capitol. Once you’ve gotten some great photos from State Street, head into the Capitol for photos of the impressive rotunda. After passing through security, visitors can take self-guided tours of the building during normal business hours. Another shot from the interior of the Capitol. The classic shot is looking up at the rotunda high above, but there are many great details and pieces of architecture that could take a lifetime to discover. Nighttime in downtown Harrisburg from Negley Park. 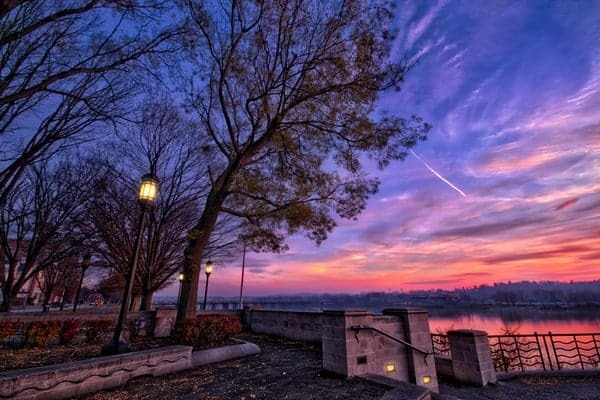 Located across the Susquehanna River from downtown Harrisburg, Negley Park offers an amazing view of the city and the impressive river below. A perfect spot to catch sunrise, Negley Park feels a bit like Mount Washington in Pittsburgh in that it’s one location that allows you to photograph Harrisburg’s skyline from a distance. The beautiful skyline of Harrisburg from Negley Park. 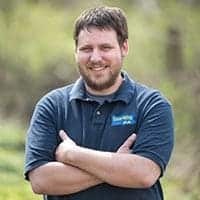 In addition to being a great spot for skyline photos, Negley Park is also popular with those looking for the best place to watch fireworks in Harrisburg. Whether they are being set off from the tip of City Island or FNB Field, the park is a great vantage point to view fireworks. City Island is a great place from which to photograph downtown Harrisburg. City Island, which sits in the middle of the Susquehanna River, offers many great opportunities for photos. 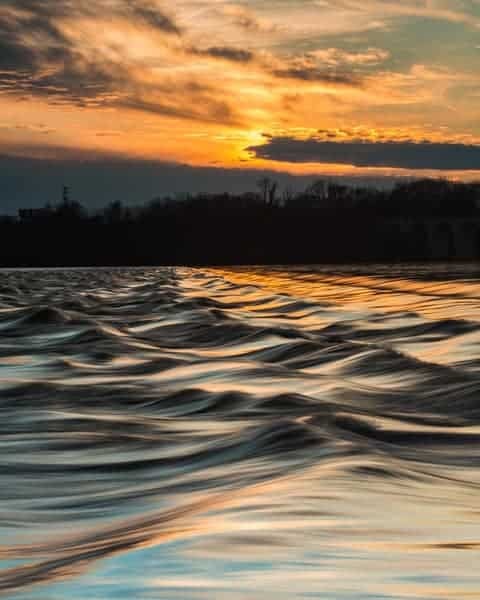 Stroll the island and photograph its beautiful nature while enjoying the beauty of the Susquehanna River and the bridges that cross it, especially to the south. After dark, the reflections of the city and its bridges make for striking photos. 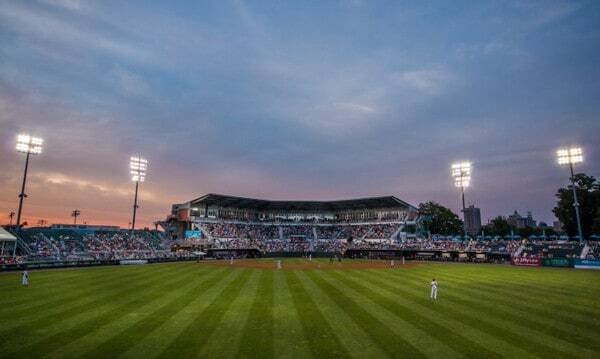 City Island is also home to both the Harrisburg Senators baseball team and the Harrisburg City Islanders soccer team. Both teams offer great opportunities for budding sports photographers. The professional baseball and soccer games on City Island are great opportunities for photos. 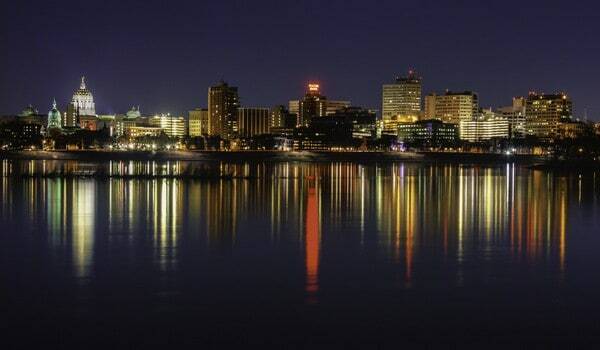 Of course, City Island is also another great place to photograph the Harrisburg skyline from. 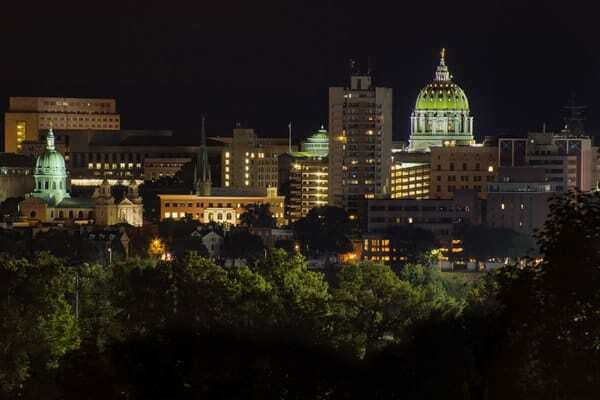 Both the southern and northern ends of the island offer great vantage points, and they are unique enough that there’s no reason to not photograph Harrisburg from both spots. Sunset along Harrisburg’s Riverfront Park. Riverfront Park stretches 3.5 miles along the Susquehanna River. Popular with walkers, runners, and bikers, the park offers fantastic views of the Susquehanna River. The walkway along the river also offers great opportunities for photos. While there is great beauty all along the park, I tend to focus my time photographing roughly between the bridges at Market Street and Forester Street. I love shooting both from the upper path that runs along Front Street and also from the lower path that is closer to river level. 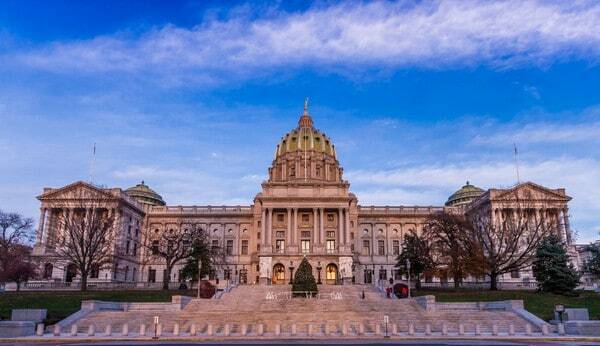 The beautiful Pennsylvania State Capitol as seen from Soldier’s Grove. Located behind the Pennsylvania Capitol Building, Soldier’s Grove offers a lesser-seen vantage point to photograph the building. Soldier’s Grove is a small grassy area behind the Capitol that honors Pennsylvanians that won the Medal of Honor. Photos here add some natural beauty to shots of the Capitol that is hard to get when shooting from State Street. 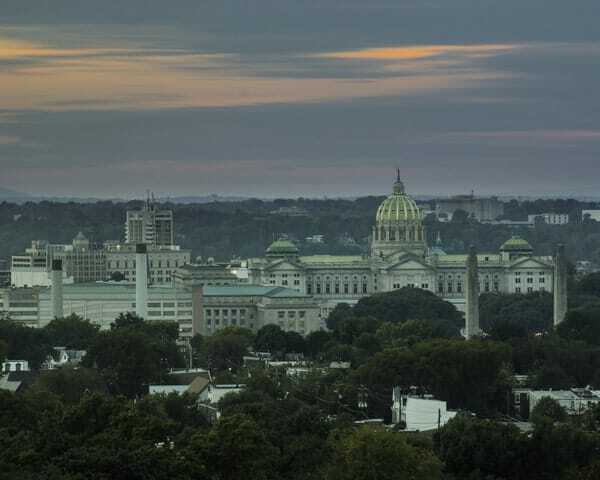 Shooting photos from behind the PA Capitol also gives you the opportunity to get some color from the sky at sunset into your photos of the building. 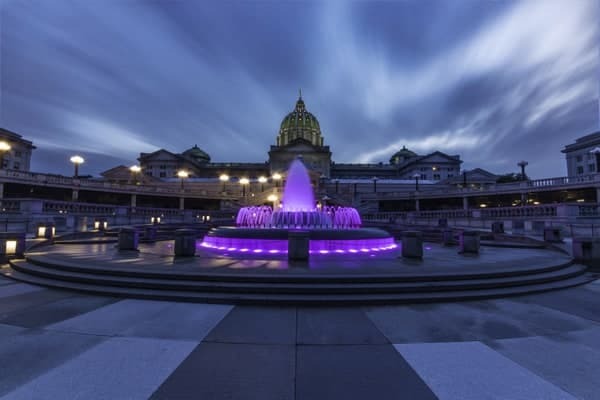 The beautiful fountain at the backside of the Pennsylvania Capitol. While it’s technically not in Soldier’s Grove, don’t miss the beautiful fountain that is located just across the street from the grove. Filled with water during the warmer months of the year, this fountain offers a great foreground element for shots of the building and changes color every few minutes. Overlooking downtown Harrisburg from Reservoir Park. 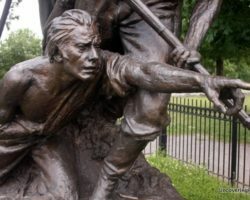 Located on Harrisburg’s eastern edge, Reservoir Park is the city’s largest park and is topped by the National Civil War Museum. 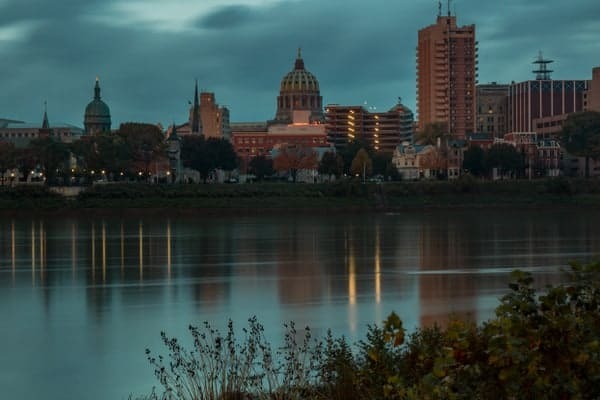 From near the museum, it’s possible to capture a unique photo of the Harrisburg skyline with the Capitol in the foreground, as opposed to being behind the city as you get in photos from the opposite side of the Susquehanna. Another view of the Capitol from Reservoir Park. 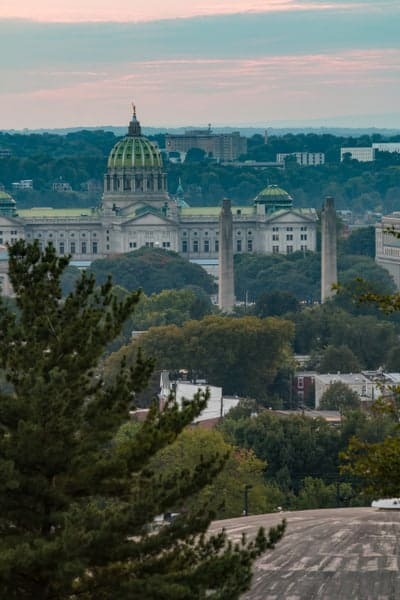 Interestingly, while few come to view this vantage point today, the park was created around the town’s reservoir after it was recognized as being a great vantage point for viewing the Pennsylvania Capitol and the surrounding mountains. Sunset over the Susquehanna River from Shipoke. Shipoke (pronounced Shy-poke) is a neighborhood just south of downtown Harrisburg. While it’s not technically part of Riverfront Park, it also runs along the river through this historic neighborhood. In addition to having some of Harrisburg’s most beautiful homes, Shipoke offers great views of the river and the city. Bridges over the Susquehanna as seen from Shipoke. One point that I especially like is the small dam below the I-83 bridge. While the highway above makes the scene a bit noisy, the beauty of the river here is hard to find elsewhere, and this a great spot from which to watch sunset. 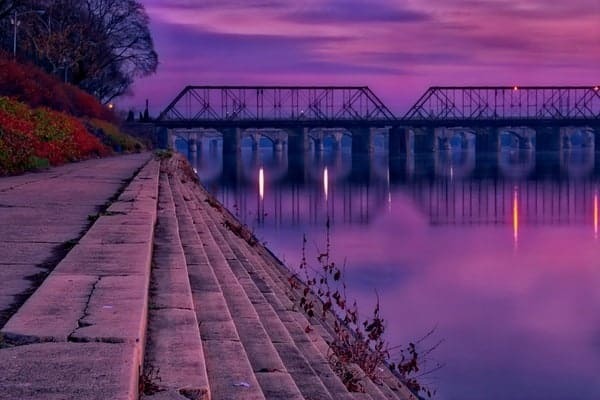 The beautiful Japanese bridge in Harrisburg’s Italian Lake. 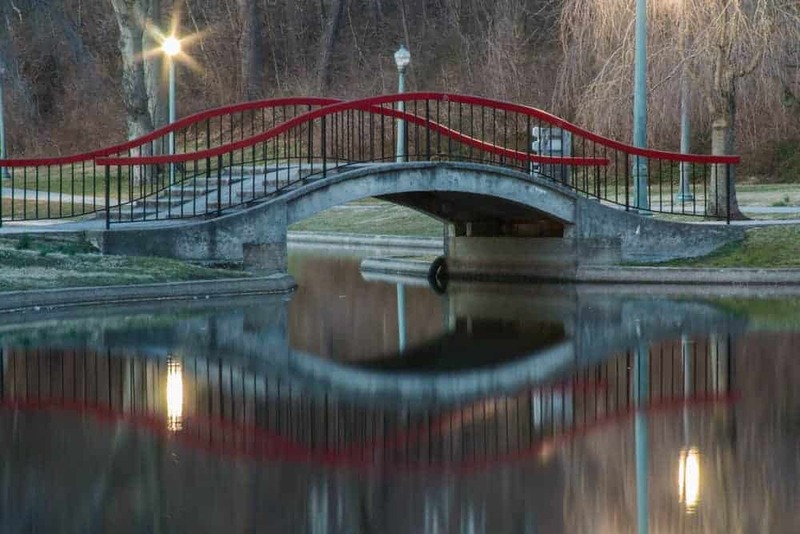 Located north of downtown Harrisburg in the city’s Uptown neighborhood, Italian Lake is a small park with Italian Renaissance-style formal gardens, vintage street lamps, and even a red Japanese bridge. During the summer months, the park comes alive with live music and fountains in the middle of the small man-made lake. This park is one of the nicest, manicured gardens in the city and is well-worth taking the time to explore. The Wormleysburg waterfront offers great chances for photos; just use extreme caution along the road. 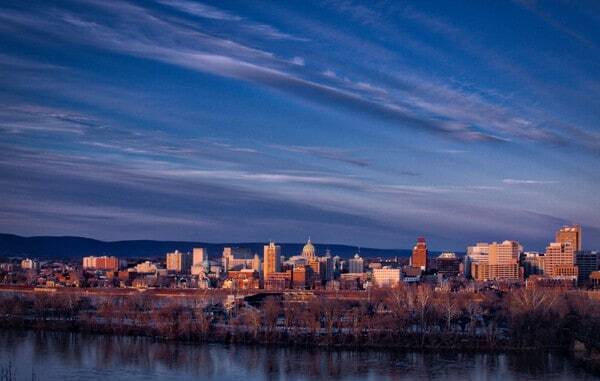 All along the western shores of the Susquehanna River are great spots to photograph Harrisburg’s skyline. Unfortunately, there aren’t very many places where you can safely stand on the river side of the road to get photos of the city. However, there is a tiny little park area just south of the Harvey Taylor Bridge that is perfect for photos. This spot is an ideal location to shoot the city, especially at sunrise or during the city’s firework shows. 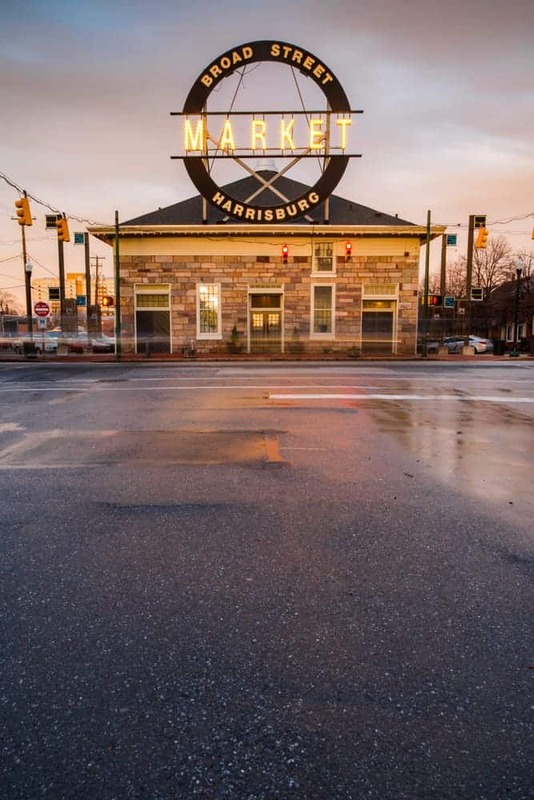 Harrisburg’s Broad Street Market is a great destination for photography. 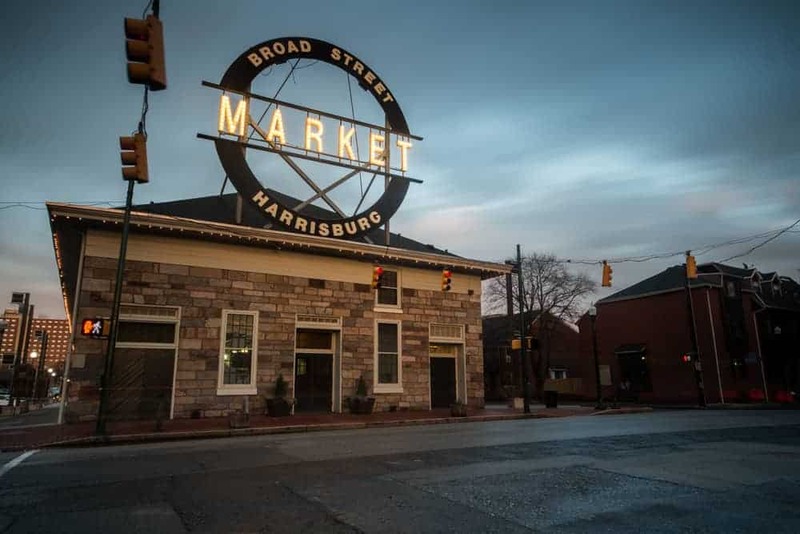 Found in 1860, Broad Street Market is one of the oldest continually-operating markets in the country. The market is comprised of two buildings located on Verbeke Street between 3rd and 6th Streets near Midtown Scholar. The buildings were both completed in the mid-1800s and feature a variety of food vendors and farm stands. Looking up the street at Broad Street Market. When the market is open (year round, Thursday-Saturday) the interior offers many opportunities for great photographs. However, even if you can’t see inside, the exterior of Broad Street Market is great for photos. This is especially true when the sign at 3rd and Verbeke is lit up in the early evening. 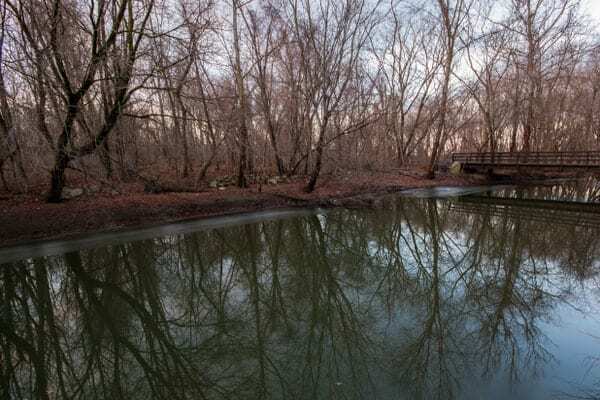 Located along the northern edges of Harrisburg, Wildwood Park is one of the best places in the city for a hike. 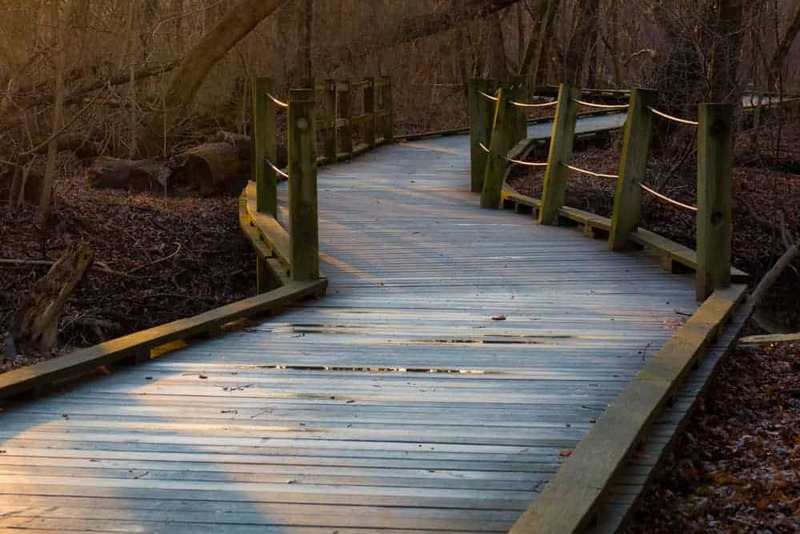 The 210-acre park is crisscrossed by six miles of trails, including a complete circuit of the 90-acre lake. The trails here are a mix of paved bike paths, wooden boardwalks, and dirt trails, and offer a bit of something for everyone. This park is quite popular with wildlife photographers looking to photograph birds, and there are several viewing platforms set up throughout the park. The reflections in Wildwood Park are simply amazing. My personal favorite part of this park are the amazing reflections created by the very still waters of Paxton Creek. The mirror-like reflections are better than those I’ve seen just about anywhere else in the region. 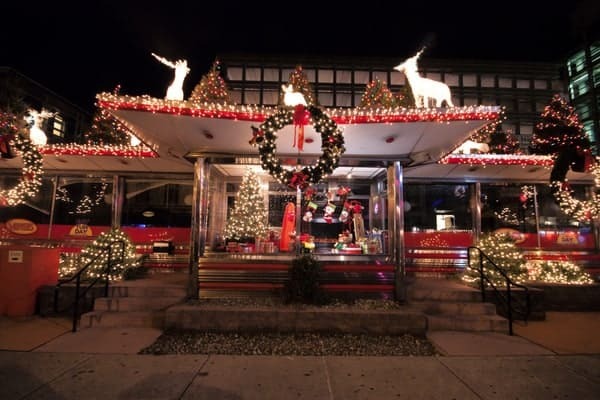 Restaurant Row offers many chances for photos, especially around the holidays. 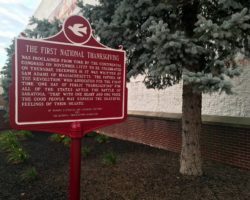 Located along Second Street between roughly Market Street and State Street, Restaurant Row is the center of Harrisburg’s dining and nightlife. Restaurants and clubs line the roadway and really come to life on Friday and Saturday nights. 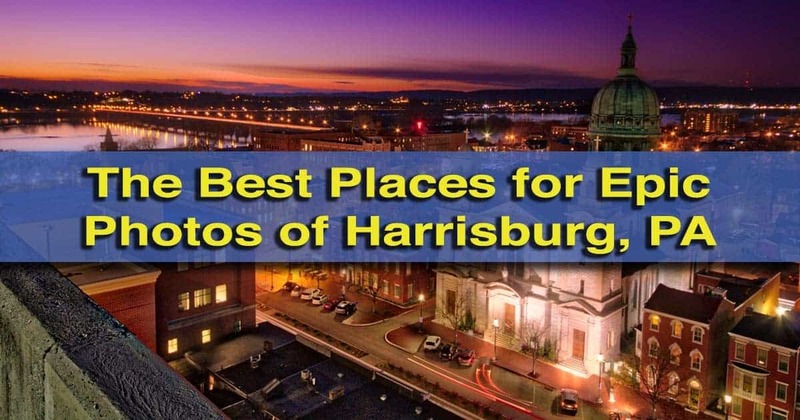 However, no matter the day, this is a great area to photograph life in Harrisburg and some of the region’s hotspots. 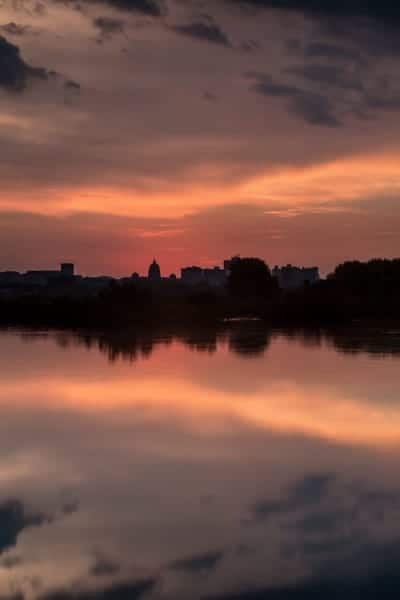 Sunrise in Harrisburg from the West Fairview Boat Launch. This little-known boat launch northwest of downtown Harrisburg is a great place to photograph the city of Harrisburg, especially at sunrise. A good zoom lens is important here, as the city is a bit far away, but the payoff can be worth the drive out of the city. The reflections from the boat launch can be quite amazing. What really makes this spot great, in my opinion, are the many small islands that dot the river between the boat launch and the city, offering a unique look for photographs of Harrisburg’s skyline. 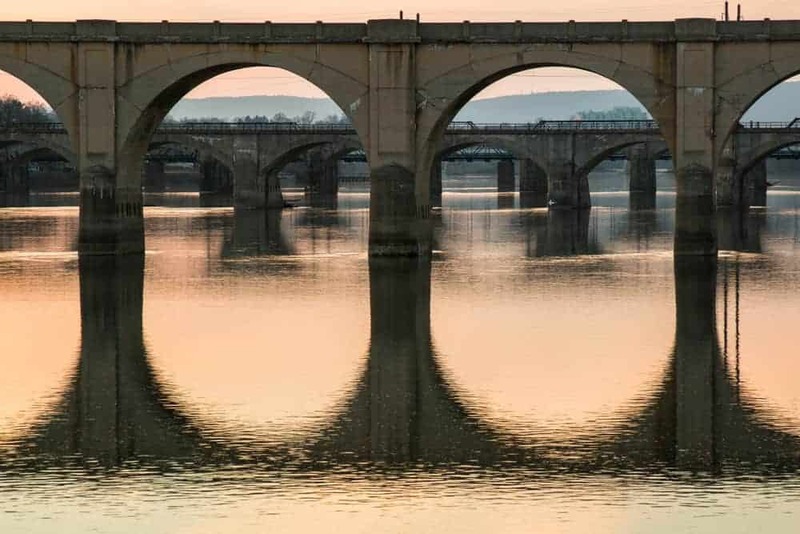 Do you know of a great spot to photograph Harrisburg? Let us know in the comment’s section below. 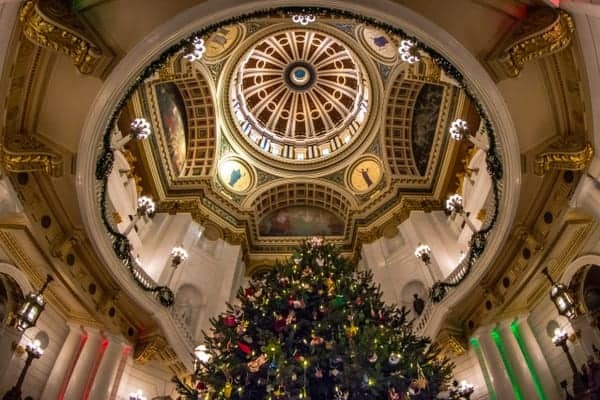 Planning a trip to Harrisburg? 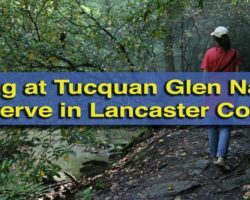 Try hiking in Fort Hunter Conservancy, the Pennsylvania Fire Museum, and the State Museum of PA. Looking for more great photography locations? UncoveringPA also pulled together the best photo destinations in Pittsburgh and the most epic spots for photos in Philly. 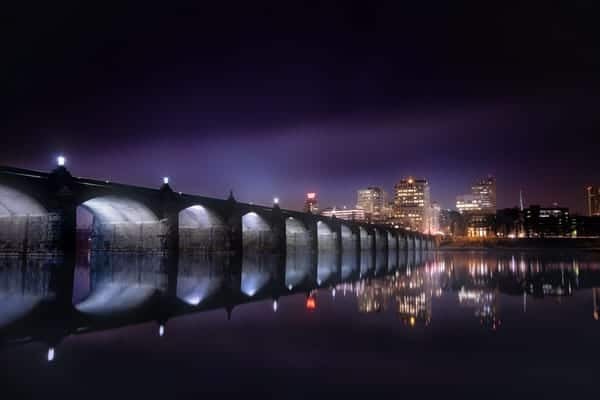 Don’t see how anyone could say Harrisburg is an ugly city…..It isn’t HUGE…and it isn’t tiny, but it is gorgeous with the riverfront….and Shipoke , bridges and City Island. Thank you for your pictures and location references. Another point to get a good view of Harrisburg is from along Route 15 at the high point overlooking the Enola Railroad Yard. 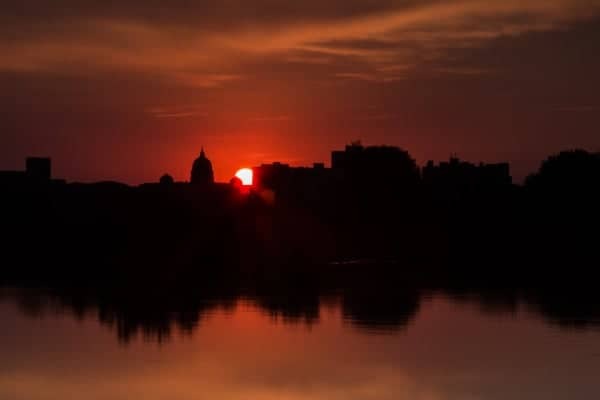 The view of Harrisburg from the northwest is great, especially during vivid sunsets. If you want to get a super view of the entire region, then go up Valley Road (from Enola) and turn right on to Tower Road. Travel on Tower Road over I-81 and turn right and go up the mountain (when no leaves on trees). From several spots on that road you’ll get an expanded view of the Harrisburg and it’s suburbs. You can get many different views between panoramic to telephoto views. Best regards, Bill C.
Negley Park is almost like a little Mount Washington. There are some trees/plants blocking part of the view that if removed, would allow almost full view of the Harrisburg skyline. The lookout at this park could really become a popular destination with a few enhancements such as tree trimming, etc.